In the U.K. sitcom available on streaming service BritBox, Manville plays the polar opposite of her film role, a gentle soul with never a harsh word to say. It's further proof of the actress' shape-shifting artistry that has made her a favorite of top directors and actors. Let's name drop: Daniel Day-Lewis, the triple Oscar-winning star who played opposite her in "Phantom Thread." The film's acclaimed director, Paul Thomas Anderson. Mike Leigh, another singular filmmaker, who has featured Manville repeatedly, including as a faithful wife in "Topsy Turvy" and damaged woman in "Another Year." For good measure add Jeremy Irons, her co-star in a production of "Long Day's Journey into Night" coming to New York's Brooklyn Academy of Music May 8-27 (and then to Southern California's Wallis Annenberg Center) after a heralded London run. 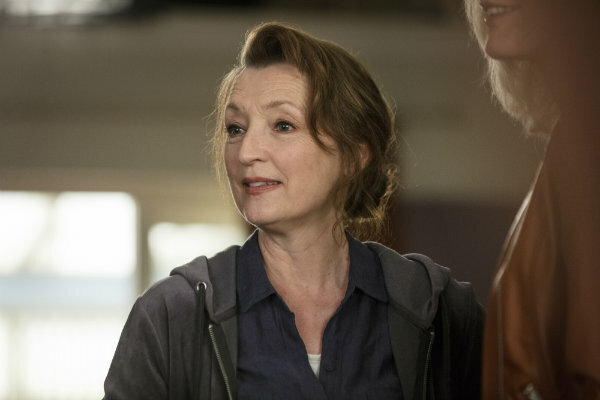 All that achievement and yet Manville is as warm — if far more spirited — than Cathy, her character in "Mum," which debuts its second season on May 13, Mother's Day. But she's not a match for Cathy's "miraculous" tolerance, the English actress insists. "If there was an emoji that depicted Cathy, it would just be one big heart," she said. "She allows people to be what they are. That's a great thing, really, and something I probably fall short of in my own life. She allows people to come to their own conclusions about their own shortcomings or misgivings or bad behavior without judging them." Cathy, a recent widow and teacher's aide, is tested by her loving but clueless adult son and his even more clueless partner (Sam Swainsbury, Lisa McGrillis). Her circle also includes a jolly brother and his snobbish girlfriend (Ross Boatman, Dorothy Atkinson), and a kindly longtime friend (Michael Mullen) who wants to be more to Cathy but needs a little help. Each episode is titled for the month in which it takes place, tacking through the calendar as Cathy attempts to rebuild her life after her husband's death. Manville empathizes with Cathy's new challenge of single motherhood. While the character takes on the challenge late in life, the actress said she had the task of bringing up her son, Alfie Oldman (from her short-lived marriage to Gary Oldman. He won a best actor Oscar this year for "Darkest Hour"). "I understand the delicacies and the dances that one needs to do around a teenage and 20-something-year-old son. They can be a tricky, delicate territory, and you have to be careful," she said. Manville holds the center steady in "Mum" as her co-stars spin around her with impeccable comic timing, especially Atkinson (another repertory player in Leigh's films) as social climber Pauline and McGrillis as self-absorbed girlfriend Kelly. The ensemble's byplay is so fresh that it seems certain improv must be involved. It's not, said Manville, crediting the impression to how "brilliantly" her fellow actors perform and to the work of series creator Stefan Golaszewski. "That is a testament to how well Stefan writes it," she said. "You don't need to ad lib and go off script to make the moment better. He charts the subtlety of the characters so beautifully. He writes from such a human, tender place as a person and as a writer that you don't need to embellish it." For Manville, any worthy project has to start with the script. Then comes the director, she said, and working with such outstanding ones as Anderson and improv-master Leigh helps her raise her game. "What I enjoy is that I don't go from one great auteur director to another and want them to work in the same way that the previous one had, because what would be the point? They both have their own ways of working. So I've needed to be, and wanted to be, open to them," Manville said. Because she is not a filmmaker, she added, "I need to put myself in the hands of these two geniuses and go with it. If I give myself up to it, I know because I'm flexible and malleable I can do some really good work." Anderson has said his admiration for Manville's performance as Cyril, sister to Day-Lewis' fashion designer, was obvious on the set of "Phantom Thread." "My love affair with Lesley Manville was to the point where the crew (would tease), 'Teacher's pet.' ... You could ask her to do anything, she could do it," Anderson said during an American Film Institute Conservatory Q&A in March. Not every director can expect the much-honored stage and screen actress to surrender her autonomy. "I can smell a bad one very quickly," Manville said, with a distinctly un-Cathy chortle.